Go Big! Go Six Flags Magic Mountain! Six Flags Magic Mountain is a 262-acre (106 ha) theme park located in the Santa Clarita, California, neighborhood of Valencia, 35 miles (56 km) northwest of downtown Los Angeles. It opened on May 30, 1971, as Magic Mountain, a development of the Newhall Land and Farming Company. In 1979, Six Flags purchased the park and added the name "Six Flags" to the park's title. With 19 roller coasters, Six Flags Magic Mountain holds the world record for most roller coasters in an amusement park. In 2017, the park had an estimated 3.3 million visitors, ranking it sixteenth in attendance in North America. Grand Carousel is a family friendly ride located in the Six Flags Plaza area. Jet Stream is a family friendly flume ride located near the entrance to Gold Rusher. The ride opened in 1972. When the park opened, there were 500 employees and 33 attractions, many of which were designed and built by Arrow Development Co. which designed and built many of the original attractions at Disneyland. The admission price in 1971 was $5 for adults, and $3.50 for children between the ages of 3 and 12. Because the park was in a relatively remote part of Los Angeles County, the Greyhound bus line provided bus service to and from the park and Los Angeles, as well as from Northern California, and optionally allowed purchase of park admission at the time the bus ticket was purchased. At its 1971 opening, the rides and attractions included Gold Rusher, a steel coaster; the Log Jammer, a log flume; the Sky Tower, an observation tower; Grand Prix, similar to Disneyland's Autopia ride; El Bumpo, bumper boats; a Carousel; and other smaller rides. There were four transportation rides to the peak: Funicular, a cable railway or funicular, later renamed Orient Express; the Metro, which consist three monorail stations around the park: Whitewater Lake, Country Fair, and Mountain stations; and "Eagles Flight", a skyride that combined two stations at the peak: the long one north to Galaxy Station, and the short one west to El Dorado Station. The Showcase Theater (renamed Golden Bear Theater), was part of the original park and featured Barbra Streisand as the first of many headline performers who would appear at Magic Mountain over the years. In the 1971 season, Magic Mountain obtained permission from Warner Bros. to use Looney Tunes characters. However, they did not continue using the characters after their first year. In 1972, they began using trolls as the park mascots. The trolls King Blop, also known as King Troll, Bleep, Bloop, and the Wizard became recognizable symbols of Magic Mountain. All King Productions, a contractor, provided the entertainers wearing the costumes until December 31, 1972, when Magic Mountain took on that role. The characters were used until 1985. Also in 1972, a second flume ride named Jet Stream was added. In 1973 the park added its second roller coaster, the Mountain Express, a compact Schwarzkopf Wildcat model steel coaster. In 1974 the park also installed a new complex of spinning rides in what would later be known as Back Street. The new additions consisted of the Himalaya, Electric Rainbow, and Tumble Drum. In 1975, the Grand Centennial Railway opened in the Back Street. It took riders on a train journey to Spillikin Corners and back. Roaring Rapids is a river rafting water ride at Six Flags Magic Mountain. With the opening of Great American Revolution in 1976, Magic Mountain became the first park in the world to have a modern, 360-degree steel looping coaster (though previous roller coasters with loops had been built and dismantled elsewhere due to safety issues). When it was built, there was very little in the way of surrounding brush. Now, the tracks are surrounded by trees and bushes, which prevents the riders from knowing the track layout beforehand. Universal then filmed a major movie at Magic Mountain with the Revolution as its centerpiece called Rollercoaster in 1977. Colossus was a wooden roller coaster which opened in 1978. In 1978, Colossus, at the time the fastest, largest dual-tracked wooden coaster, opened. Following its first season, it was closed and extensively redone. When it reopened, it was a much smoother ride. In 1991, the camel hump before the last, or third, turn was replaced by a block brake. Though it decreased the speed of the ride after this particular brake, it did allow three trains to run per side at a time, greatly increasing capacity. One of the trains sometimes ran backwards for a few years in the mid-80s. However, until the late 1990s this kind of ride was no longer possible due to the newer ride system in place, as well as different trains. During Fright Fest, the park runs one side backwards using a set of trains acquired from the now demolished Psyclone which was located on the other side of the park. In 2015, the coaster was re-tracked with steel tracking and several inversions were added to the coaster. It was subsequently rebranded "Twisted Colossus". This renovation was completed by Rocky Mountain Construction. The opening drop on Goliath. Goliath featured the longest drop on a closed circuit roller coaster when it opened in February 2000. In 1979 the park was sold to Six Flags and became known as Six Flags Magic Mountain in 1980. In 1981, Six Flags Magic Mountain introduced a ride that was on the west coast for the first time called Roaring Rapids. It was developed by Intamin in conjunction with the now defunct Six Flags Astroworld, which had opened a similar ride in 1979. Along with Rapids came the completion of the midway near Spillikin Corners to link with Revolution's area. Finally, a complete circuit could be made around the park. It was originally designed as a dual-sided station, but only one was fully developed, and all that exists of the possible second side is a few supports. It uses large pumps to circulate water, and each of the two pumps can circulate 88,500 gallons per minute. The reservoir can hold 1.5 million gallons of water, and one of the innovations used on it was the introduction of guide boards to help eliminate jam ups. In 1982 the attraction Freefall was added. Also built by Intamin, it was considered a cutting edge drop tower ride, if not strictly a "roller coaster." It simply ascends the tower and then drops down, with the track curving to horizontal, leaving riders on their backs. Others were built for other parks (some of which are Six Flags). Today, most of these rides are obsolete and have been removed. Some flat rides were added and others removed the next year. In 1984 Sarajevo Bobsleds was erected. Yet another ride built by Intamin, the coaster was basically a bobsled without ice and snow. The coaster was built in honor of the 1984 Olympics. Six Flags Great Adventure added a similar ride that same year. In 1986 Sarajevo Bobsleds was removed and now operates at Six Flags Over Texas as La Vibora. The other bobsled was moved to Six Flags Great America and later to The Great Escape in Queensbury, New York, where it operates as Alpine Bobsled. In 1985 Children's World was rethemed as Bugs Bunny World, as Magic Mountain had abandoned the Trolls in favor of the Warner Brothers' characters. That year, Michael Jackson visited the park, riding rides such as Colossus, Revolution and Roaring Rapids. In 1986, the park added a steel stand-up looping roller coaster called Shockwave designed by Intamin. This coaster was located in the back of the park replacing Sarajevo Bobsleds. At the end of 1988, the coaster was removed as part of a ride rotation program and went to Six Flags Great Adventure in 1990. It was removed from there in 1992 and was repainted white and rethemed upon its removal to Six Flags Astroworld. There it was known as Batman The Escape. When Astroworld closed in 2005, the ride was put in storage at Darien Lake. In 1987 the park re-themed the Back Street. Spinning flat rides were renamed Turbo (Electric Rainbow), Subway (Himalaya), and Reactor (Enterprise). The dance club was rethemed as well, and located near Reactor. After Hours, as it was now called (formerly Decibels), for one summer stayed open later than the rest of the park. It, along with Back Street, would stay open an additional two hours as a place for locals to hang out. This format lasted one season. In 1988 Ninja, "The Black Belt of Roller Coasters", opened. Built by Arrow Dynamics, it was the first suspended swing roller coaster on the West coast. Ninja has gone through very few changes since it was opened in 1988; evidently only the wheels and paint have been changed. Tidal Wave is a Shoot the Chute water ride, featuring a 50-foot (15 m) splashdown into a large body of water. Tidal Wave opened in 1989. It is a short, wet ride featuring a large boat that travels up a low-angled incline to a level water trough. The trough, in the shape of a semicircle, ends in a steep drop into a large splashpool. The impact displaces large amounts of water on its riders. The ride's exit ramp crosses over the splashpool, allowing willing patrons leaving the ride to get soaked from the splash. In 1990, Viper, a multiple looping coaster designed by Arrow Dynamics opened. It features a 188-foot (57 m) drop, speeds up to 70 mph (110 km/h), 3 vertical loops, a batwing turn that inverts riders twice, and a double corkscrew. In 1991 Magic Mountain added Psyclone, modeled after the Coney Island Cyclone. The Spillikin Corners area of the park was re-themed as Cyclone Bay to suit the new coaster, drawing guests into this area. The change was largely cosmetic, as the earlier theme relied on retail establishments that had been removed previously. The Glass Blower had been replaced by the Shooting Gallery, and the Candy Kitchen viewing area was redesigned. With Psyclone, the crowds returned. Due to the 1994 Northridge earthquake, Psyclone's structure was damaged causing a very bumpy ride and the coaster was never the same. (Psyclone was later removed in 2007.) After adding Ninja, Viper, and Psyclone within 4 years, the park was getting a large repertoire of big roller coasters. The next year, 1992, a coaster built by Intamin called Flashback was added. This one-of-a-kind ride, originally planned to be enclosed in a building, had already operated at Six Flags Great America and Six Flags Over Georgia prior to its arrival. Very steep, short drops were designed to make riders feel like they were "diving" down in a plane, and it ended in a 540 degree upward spiral. But, because of the shoulder harnesses, riders were subjected to a lot of head banging. This coaster rarely ran by 1996 (it created too much noise for the nearby water park) and on January 23, 2007, the park announced that Flashback would be removed along with Psyclone. The park also stated that Flashback might be re-built elsewhere within the park for 2008 but the ride was finally scrapped at the end of 2008. In 1993 Six Flags Magic Mountain entered the Time Warner era. The new ride for the year was Yosemite Sam Sierra Falls. It was a water ride that has two twisting tubes that riders could slide down in using a raft. (Yosemite Sam Sierra Falls was demolished in 2011 to make room for Road Runner Express.) Also that year, there was re-theming and High Sierra Territory was opened. The Showcase Theatre became Golden Bear Theater, the Animal Star Theatre was created in Bugs Bunny World, and a large, fake, wooden tree was built. This year also saw the end of live non-Christian themed concerts in the park due to the riot that broke out as a result of a "TLC" concert that was oversold. Magic Mountain was quickly overwhelmed by large crowds that vandalized and destroyed property. Park shops had their windows broken and looting quickly followed. Police were called to the scene in full riot gear. The Park was evacuated and closed down for the night. In 1994, Magic Mountain added what two other Six Flags parks already had, a Bolliger & Mabillard inverted looping roller coaster called Batman: The Ride (which other Six Flags parks also added in the coming years). Batman: the Ride (BTR) is an inverted coaster, meaning the usual coaster protocol is reversed; the track is overhead and the cars are below it. The trains travel on the outside of the loops, and rider's legs hang freely, as on a ski lift. In 1995, a separately gated waterpark called Six Flags Hurricane Harbor opened in June. The park included body slides, tube slides, a kiddie water play area, lazy river, and a wave pool. The following year, a SkyCoaster called Dive Devil opened at Magic Mountain. A dual launch coaster called Superman: The Escape debuted at the park on March 15, 1997. Designed by Intamin, the 30-second ride launches riders from 0 to 100 mph (160 km/h) in seven seconds on a track that scales up a 41-story tower. It was the first roller coaster in the world to reach speeds of 100 mph. In 2011, it received a new color scheme and was renamed "Superman: Escape From Krypton". In addition, the trains were reversed to provide a backward-facing launch. The Riddler's Revenge is a stand-up roller coaster which features 6 inversions. In 1998, a new Bolliger & Mabillard Stand-up roller coaster called Riddler's Revenge opened as the tallest and fastest stand-up roller coaster in the world. Also in 1998 Six Flags was sold to Premier Parks. The next year saw no dramatic changes. In 2000, a steel hypercoaster, Goliath, was added. It was built by Giovanola. 2001 was to be the year of three new roller coasters, but only one actually opened on time: Goliath Jr., a steel kiddie coaster. The other two, Déjà Vu and X (now X²), had mechanical problems. Déjà Vu opened late in 2001 and X opened early in 2002. Déjà Vu was designed by Vekoma and is a Giant Inverted Boomerang coaster (GIB), a variant of their popular Boomerang design. It is an inverted coaster with coaches suspended beneath an overhead track that traverses an open-circuit track forward and in reverse and features two completely vertical drops and three inversions. It opened late in 2001, but suffered a lot of downtime. X was designed by Arrow Dynamics, as the world's first "fourth-dimensional" roller coaster. It is the only one in North America where riders experience going 360 degrees in their seats. Each seat lies on a separate axis from the track. This coaster managed to open briefly on January 7, 2002, only to close due to more technical problems. It reopened late in August of that year. The ride closed for a major refurbishment and re-theme in 2008 where X transformed into X2. In 2003, Scream!, designed by Bolliger & Mabillard was added. At this point, Six Flags Magic Mountain tied with Cedar Point for the park with the most roller coasters in the United States. Scream is similar in concept with Medusa at Six Flags Discovery Kingdom and is a mirror image of Bizarro at Six Flags Great Adventure. It is a floorless roller coaster with trains riding above the rails traversing seven inversions on 3,985 feet (1,215 m) of track on floorless trains. 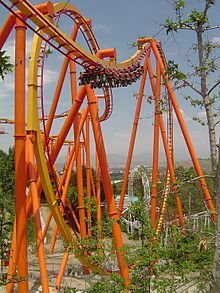 In 2006, Tatsu, a Bolliger & Mabillard flying roller coaster was added, causing a temporary closure of Revolution to allow construction to take place. It was much larger than the other three Bolliger & Mabillard Flying Coasters at other Six Flags parks, all named Superman: Ultimate Flight. Tatsu has a suspended-track orientation featuring vehicles that recline passengers with their backs against the track and facing the ground. This brought the park up to 17 roller coasters, to tie with Cedar Point for the greatest number of roller coasters in a park (albeit Flashback had been standing but not operating for an extended period of time and thus it is debatable whether the park could claim 17 as its number of roller coasters). On June 22, 2006, Six Flags, Inc. announced that it was exploring options for six of its parks, including Magic Mountain and its neighboring water park, Hurricane Harbor. Though management said closing the park was unlikely, rumors still began that the park could be sold to real estate developers, with an intent to close the park and build housing developments in the area. Park officials cited dwindling attendance due to rowdy behavior among some of the park-goers (notably gang members and other teenagers and young adults, who account for a large percentage of the park's attendance) as reasons for wanting to sell the park while management was wanting to move Six Flags into more of a family park direction. Throughout the Six Flags chain, attendance in the second quarter of 2006 was 14 percent lower than it was in the second quarter of 2005. By the fall of 2006, Six Flags announced that Magic Mountain was still up for sale. They also stated, however, that it would be sold to a company that would continue to operate it as a park, and that closing Magic Mountain was not a possibility. Cedar Fair, Anheuser-Busch, and several others considered buying the park but none of the offers came close to the asking price. When Six Flags announced which parks it was selling in January 2007, Magic Mountain was no longer one of them. The company decided not to sell Magic Mountain and its adjacent water park. Spokeswoman Wendy Goldberg said that upon further evaluation, the company decided that the Los Angeles parks remained too valuable to relinquish, as sales were increasing, and that the park would not be sold. Other parks were sold as a package and remained open. Tatsu, one of the roller coasters at Six Flags Magic Mountain. Twisted Colossus, one of Magic Mountain's most signature and iconic roller coasters. Colossus was shut down in 2014 to become reborn as Twisted Colossus. Psyclone was removed in 2007, and Flashback was demolished in early 2008. As a result, Six Flags Magic Mountain no longer tied the record for the most roller coasters in a single park, relinquishing the record to Cedar Point – the park's total had never surpassed Cedar Point but had tied numerous times. The park began focusing more attention on marketing with family-oriented values, and a new children's theme area, Thomas Town, was added in 2008. The park renovated one its thrill rides, however. "X" was closed in late 2007 for its transformation into X2 which featured new fourth-generation trains, a new paint job, and special effects that included flame throwers and audio. It reopened in 2008. In the same year, the park began work on the "Magic of the Mountain" museum at the top of its Sky Tower attraction that contained memorabilia throughout the park's history including old television commercials, park maps, models, and equipment saved from defunct rides. Terminator Salvation: The Ride, a wooden roller coaster, opened on May 23, 2009. It was built in the former location of Psyclone and featured tunnels, spraying mist, and special effects. On January 9, 2011, the ride was renamed to Apocalypse and given an appropriate theme that reflects an "end of the world" scenario. Later that year, Six Flags President and CEO Mark Shapiro said in a Los Angeles Times published interview that Magic Mountain had plans to install a new roller coaster for its 2010 season, and would add a new themed area for children in 2011 called Wiggles World. Shapiro also stated that the adjacent Hurricane Harbor would receive an expansion. On May 29, 2010, Mr. Six's Dance Coaster was scheduled to open but it was delayed until 2011 when it would open under a new theme. On the same day, Mr. Six’s Splash Island opened at the adjacent Hurricane Harbor water park. 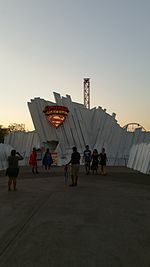 On August 3, 2010, it was announced that Superman: The Escape would undergo a major redevelopment before the 2011 season. On October 20, 2010, Six Flags Magic Mountain officially announced their full plans for 2011 after a video was leaked six days earlier. In addition to opening Mr. Six's Dance Coaster under a new name and theme, Six Flags announced two other attractions. In time for the 2011 season, Superman: The Escape was refurbished to Superman: Escape from Krypton and featured new backwards launching cars and a new color scheme. The third and final announcement regards an entirely new thrill roller coaster. The Green Lantern: First Flight opened in July 2011 as Magic Mountain's eighteenth roller coaster. It is a Intamin ZacSpin. This roller coaster reclaimed the world record for the highest number of roller coasters at a single theme park. It was later announced, on November 4, 2010, that the children's roller coaster will be called "Road Runner Express" and has been located in Bugs Bunny World. In late 2010, Six Flags began the process of removing non-Warner Bros. licensed theming from attractions. They terminated several licenses including Terminator and Thomas the Tank Engine. Terminator Salvation: The Ride was renamed and rethemed into Apocalypse which re-opened on January 8, 2011. Thomas Town was renamed and rethemed to Whistlestop Park in time for the 2011 season. 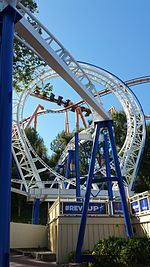 On January 18, 2011, the LA Times reported after considering a new theme based on DC Comics superhero sidekicks, the park opted for simplicity and renamed the Little Flash coaster to Road Runner Express. Due to Green Lantern being placed in Gotham City Backlot, Gotham City was re-themed into DC Universe. In addition, Grinder Gearworks became "Wonder Woman: Lasso Of Truth" and Atom Smasher was renamed "The Flash: Speed Force". In August 2011, several media sources reported that Six Flags New England would install Six Flags Magic Mountain's Déjà Vu for the park's 2012 season. On September 1, 2011, Six Flags Magic Mountain announced that they would be opening a new attraction for the 2012 season named Lex Luthor: Drop of Doom. The free-fall drop attraction was integrated into both sides of the park's 415 feet (126 m) tall Superman: Escape from Krypton tower structure and ranks as the world’s tallest drop tower, featuring a plummet from 400 feet (120 m) above ground level. The following day, Six Flags Magic Mountain confirmed on Facebook that Déjà Vu will be removed from the park soon. Then on September 13, 2011, the park announced that Déjà Vu will be removed after October 16, 2011, "Déjà Vu fans, we have created some exclusive after hours ride time for you to ride it again before October 16." On October 21, 2011, Log Jammer was partially removed to open up space for Full Throttle, which opened in 2013. In August 2012, Six Flags Magic Mountain confirmed rumors that a new roller coaster, Full Throttle, would open the following season. Full Throttle opened as the park's 18th roller coaster, allowing Six Flags Magic Mountain to market having the most roller coasters in the world once again. The ride was built to feature the world's tallest vertical loop on a roller coaster at 160 feet (49 m). In addition, Full Throttle set a record for being the first roller coaster to feature a track section with rails on both sides of the spine. This occurs at the top of the ride's massive inversion. On August 29, 2013, Six Flags Magic Mountain officially announced that they would run both Batman: The Ride and Colossus backwards for a limited time of the 2014 season. They will also expand Bugs Bunny World with the addition of a new roller coaster. On April 8, 2014, Six Flags Magic Mountain announced that the park will host its first ever Holiday in the Park Christmas event in late 2014 and for future years after. In the summer of 2014, the park has placed banners across the property advertising the new now-open Bonzai Pipelines in the adjacent property, Hurricane Harbor, along with the closing of Colossus which took place on August 16, 2014. On August 28, 2014, Six Flags announced the Rocky Mountain Construction conversion of Colossus into Twisted Colossus. Twisted Colossus opened on May 23, 2015. On September 3, 2015, Six Flags announced the renovation of Revolution with a new paint scheme, upgraded lighting, and new train eliminating the controversial over-the-shoulder restraints that had been the source of the ride's spotty reputation for much of its life. Named "The New Revolution," it reopened on April 21, 2016. On September 1, 2016, the park announced Justice League: Battle for Metropolis to open in 2017. The 4D shooting dark ride is nearly identical to the six other installations located at Six Flags parks around North America. The ride opened on July 12, 2017 and is located near The Riddler's Revenge. Green Lantern: First Flight operated for the last time before becoming standing but not operating on July of 2017. On August 29, 2017, Six Flags announced the addition of a Zamperla Giant Discovery flat ride to be built in a newly renovated Boardwalk Beach area near DC Universe. Marketed as "the world's tallest pendulum ride", CraZanity takes riders to a height of 172 feet (52.4 m) and speeds up to 75 mph (120.7 kmh). On August 29, 2018, the park announced the brand new racing launch coaster West Coast Racers from Premier Rides that would include a revamp of the old Cyclone Bay area into a high energy, urban LA. The ride itself is dubbed the first launched racing coaster in the world and the first quadruple launched coaster, even though the existing Fiorano GT Challenge hold these records. The Möbius loop coaster will be the 20th coaster at the park. There are presently eleven separately themed areas within the park – each zone featuring its own distinct rides, attractions, and food service venues. DC Universe The rides and attractions in this area are inspired by the DC comics universe. Screampunk District Carnival-style games, and three of the park's largest roller coasters. Also features Lex Luthor: Drop of Doom. Bugs Bunny World Feature rides and attractions inspired by Looney Tune characters. This area also contains Whistlestop Park. There are four Junior roller coasters. Originally Thomas Town, you can see that the trains in Bugs Bunny World are just repaints of the original Thomas characters. Full Throttle Plaza Extreme lifestyle inspired, this area features an outdoor barbecue, sit-down sports bar, gift shop, splash pad, and concerts. Full Throttle is the main attraction of this area. Six Flags Plaza The main entry and exit of the park. Features gift shops, food service venues, photo services, and guest relations. Baja Ridge South of the border themed desert landscape; includes X² and Viper. Rapids Camp Crossing This area simulates a campsite set deep in the American wilderness. The main attraction of this area is the Roaring Rapids. Although not camping themed, the entrance to Tatsu is included in this area. The Underground A newly renovated area for 2019 that features Apocalypse, West Coast Racers, Jet Stream, and Cyclone 500; among others. Previously known as Cyclone Bay. Metropolis The rides and attractions in this area are inspired by the Justice League of the DC comics universe. The main attractions are Justice League: Battle for Metropolis & The Riddler's Revenge. Samurai Summit Japanese folklore and mythology themed area, with two roller coasters atop its rugged hillside. Superman: Escape from Krypton, though not Japanese themed, is included in this area. The Boardwalk A newly renovated area for 2018 that features CraZanity, Gold Rusher, Scrambler, Jammin' Bumpers, and Tidal Wave. Magic Mountain's proximity to downtown Los Angeles, the hub of the American film and television industry, has resulted in its appearance in several productions, usually representing a park other than itself. The debut of Revolution was the focal point of the 1977 release Rollercoaster. Bob Einstein, as his character Super Dave Osborne, performed his first "stunt" on a rollercoster at Magic Mountain. In 1983, Magic Mountain became the fictional "Walley World" for National Lampoon's Vacation, with scenes featuring Revolution and Colossus (each using fictional names). On television, Magic Mountain doubled as the theme park in the opening credits of the television series Step by Step. Other TV productions featuring Magic Mountain have included: NCIS, Entourage, The Bionic Woman, The A-Team, CHiPs, Wonder Woman, Way Out Games, Knight Rider, Beverly Hills, 90210, Melrose Place, The King of Queens, and Buffy the Vampire Slayer. The band Kiss also filmed their acting debut in 1978's made-for-TV Kiss Meets the Phantom of the Park that featured the band members in the park and near Colossus. In the 2000 movie Space Cowboys Donald Sutherland is shown riding Viper and is portrayed as the designer when Clint Eastwood recruits him. Magic Mountain was also the filming site for the Real Wheels video, "Here Comes A Roller Coaster", as well as for the Kidsongs 1990 video, "Ride the Roller Coaster". In the Nickelodeon show Drake & Josh, Drake, Josh, and Megan take a trip to Mystic Mountain (parody of Magic Mountain) in the episode "The Demonator", and they ride the "Demonator". Also, in another Nickelodeon show Zoey 101 Zoey and Lisa take Michael to Mystic Mountain (both Drake & Josh and Zoey 101 were created by Dan Schneider), and they help Michael overcome his roller coaster fear in the episode "Rollercoaster". He rides the "Spine Twister", which was actually the Goliath from Magic Mountain. In 1990, Nickelodeon's Wild and Crazy Kids, the wooden roller coaster,Colossus, was featured as a game called "Wacky RollerCoaster Spill". In the movie This Is Spinal Tap, the band performs as second billing to a puppet show at the fictional "Themeland Amusement Park" in Stockton, California, located 300 miles (480 km) north of Santa Clarita. The actual filming location is Magic Mountain's amphitheater. The Kidsongs video Ride the Roller Coaster is set at Six Flags Magic Mountain. Nick Cannon group The School Gyrls movie premiere was at Magic Mountain. In the new movie Judy Moody and the Not Bummer Summer, they go to a theme park and ride a roller coaster for the first time. The coaster was Goliath. Goliath was also featured as the "Aquaman" roller coaster in the third season of the HBO series Entourage. In 2011, the park was chosen as the setting for the Travel Channel's version of the quiz show Scream! If You Know the Answer. The Glee cast visited the park in 2012 for their senior skip day in the "Big Brother" episode, where they ride Viper. In 2013, a large section of the parking lot was blocked off for a Toyota Camry commercial. Both pictures and the background footage reveal Goliath and Colossus, indicating that it is Magic Mountain where the commercial was shot. The ride that was built for the commercial bears a resemblance to the park's new coaster at the time, Full Throttle: a big hill, a barrier-test loop, a backwards propulsion section, and a forwards propulsion section that runs through a tunnel placed next to the hill. In 2016, Goliath was used for a Carpool Karaoke segment with Selena Gomez. In 2017, the park was used in Katy Perry's music video "Chained to the Rhythm". Although not featured, Magic Mountain is mentioned numerous times in the Netflix horror-comedy Santa Clarita Diet. A recreation of Six Flags Magic Mountain was featured built in the computer game RollerCoaster Tycoon 2, also including a blank version of the park with no rides and attractions. It was also featured as a mod for RollerCoaster Tycoon 3 in 2014 by user "EvyandHp" on RCTgo.com. Six Flags Magic Mountain holds the record for most roller coasters in an amusement park at 19. Apocalypse: The Ride 2009 Great Coasters International The Underground Moderate Wooden roller coaster featuring steeply banked turns and twisting drops. Batman: The Ride 1994 Bolliger & Mabillard DC Universe Maximum An inverted coaster that whips around steeply banked turns and five inversions. Canyon Blaster 1999 E&F Miler Industries Bugs Bunny World Mild Junior roller coaster. Full Throttle 2013 Premier Rides Full Throttle Plaza Maximum A launch roller coaster with 2 forward launches and one backwards launch. Full Throttle has one of the world's tallest vertical loops at 160 feet (49 m) and the first ever "top hat" constructed on an inversion. Gold Rusher 1971 Arrow Development BoardWalk Moderate Riders dip, turn, and dive up and around the park's mountainous terrain. Gold Rusher is Six Flags Magic Mountain's first roller coaster. Goliath 2000 Giovanola Screampunk District Maximum Riders brave an opening drop of 255 feet (78 m) into a subterranean tunnel and multiple steep banking turns. Magic Flyer 1971 Bradley and Kaye Bugs Bunny World Mild Train themed Junior roller coaster in Whistlestop Park. Ninja 1988 Arrow Dynamics Samurai Summit Moderate Swinging coaches suspended from an overhead steel track whip around steeply banked turns and curves in and out of the treetops. The New Revolution 1976 Anton Schwarzkopf Baja Ridge Moderate (Maximum with VR Goggles.) Riders careen through steep banking turns and spirals in and out of the treetops. Revolution has a full 360 degree loop the first modern vertical loop in the world. In 2016 the coaster received a major renovation which included: new trains, lapbars, new paint job, new lighting, reduced foliage and VR Goggles were added to intensify the ride. The Riddler's Revenge 1998 Bolliger & Mabillard Metropolis Maximum Upon opening, it was the tallest, fastest, longest stand-up coaster in the world. Riders traverse six inverted turns over the course of its 4,370-foot-long (1,330 m) track. Road Runner Express 2011 Vekoma Bugs Bunny World Moderate Junior roller coaster. Scream! 2003 Bolliger & Mabillard Screampunk District Maximum Floorless trains riding above the rails traverse seven inversions on 3,985 feet (1,215 m) of steel track. Speedy Gonzales Hot Rod Racers 2014 Zamperla Bugs Bunny World Mild Race-car themed Zamperla family gravity coaster with helix. Superman: Escape from Krypton 1997 Intamin Samurai Summit Maximum First coaster to reach 100 mph. Riders accelerate in reverse from 0 to 104 mph (167 km/h) in seven seconds and climb nearly 41 stories into the air. Entrance to Superman Escape from Krypton, a launch roller coaster. Known in the past as "Superman: The Escape" (1997–2010). Tatsu 2006 Bolliger & Mabillard Rapids Camp Crossing Maximum Upon opening, Tatsu was the tallest, fastest, and longest flying roller coaster in the world. Suspended beneath a steel track, riders experience a total of 263 feet (80 m) in elevation changes while harnessed in a prone position. It also features the worlds largest pretzel loop. Twisted Colossus 2015 Rocky Mountain Construction Screampunk District Maximum Riders experience steep drops, banking curves, and two inversions on nearly 5,000 feet (1,500 m) of track - designed to pit two simultaneously operating trains in a race against each other. It is also the worlds longest racing coaster. West Coast Racers 2019 Premier Rides The Underground Maximum Quadruple launch racing coaster, In partnership with West Coast Customs. X² 2002 Arrow Dynamics Baja Ridge Maximum Riders experience predetermined forward and reverse somersaulting maneuvers while harnessed in seats that pitch on a separate axis from the track. Known in the past as "X" (2002–2007). Buccaneer 1980 Intamin Screampunk District Moderate Swinging pirate ship ride. Cyclone 500 1992 J & J Amusements The Underground Mild Go-Kart attraction. Requires nominal fee for participation. Dive Devil 1996 SkyCoaster Inc. The Underground Maximum Large swing attraction simulating the experience of sky diving. Requires nominal fee for participation. The Flash Speed Force 1974 Mack Rides DC Universe Moderate Mack Musik Express ride known in the past as Himalaya from 1974–1986; Subway from 1987–1993, ACME Atom Smasher from 1994–2004, and Atom Smasher from 2005–2010. Wonder Woman Lasso of Truth 1974 Hrubetz DC Universe Moderate First known as Electric Rainbow between 1974 and 1986, then Turbo between 1987 and 1993, then Gordon Gearworks between 1994 and 1998 and finally Grinder Gearworks between 1998 and 1999. Grand Carousel 1971 Philadelphia Toboggan Coasters Six Flags Plaza Mild A merry-go-round called PTC #21 with origins beginning in 1912. It was removed in the 1960s from the Savin Rock Amusement area in West Haven, Connecticut and sold to Magic Mountain. Grand Carousel is a family friendly ride located in the Six Flags Plaza area. Jet Stream 1972 Arrow Development The Underground Moderate Flume ride. First Arrow flume to use a turntable loading system. Known from 2001–2006 as Arrowhead Splashdown. Jet Stream is a family friendly flume ride located near the entrance to Gold Rusher. The ride opened in 1972. Justice League: Battle for Metropolis 2017 Sally Corporation Metropolis Moderate An interactive 4D shooting family dark ride. Lex Luthor: Drop of Doom 2012 Intamin DC Universe Maximum Free fall drop thrill ride from a height of 400 ft (122 m), attaining a terminal velocity of 85 mph (137 km/h). Honda Express 1971 Korneuberg Shipbuilding Company (Austria) Six Flags Plaza / Samurai Summit Mild 1,000 mm (3 ft 3 3⁄8 in) metre gauge funicular railway ride, which transports guests to Samurai Summit next to Ninja. Repainted in 2016 to blue/white in conjunction with Honda sponsorship. Previously known from 1988 - 2016 as Orient Express and from 1971–1988 as Funicular. Roaring Rapids 1981 Intamin Rapids Camp Crossing Moderate Rapids water attraction simulating a wilderness raft expedition. Roaring Rapids at Six Flags Magic Mountain. Many guests claim it is the best water ride at the park. Jammin' Bumpers 1971 Reverchon BoardWalk Moderate Bumper cars. Scrambler 2003 Eli Bridge BoardWalk Moderate The park's former old Scrambler was damaged from an uprooted tree. This Scrambler was relocated from Six Flags Over Texas. Sling Shot 2012 Funtime The Underground Maximum Sling Shot extra charge attraction. Swashbuckler 1983 Chance Rides Screampunk District Moderate Chance Yo-Yo attraction. Tidal Wave 1989 Intamin BoardWalk Moderate Shoot-the-Chute flume. Goes under a bridge on which people get soaked. Tidal Wave is a Shoot the Chute water ride which features a 50-foot (15.2 m) drop. The ride is labeled by Six Flags Magic Mountain as a family friendly ride. CraZanity 2018 Zamperla BoardWalk Maximum A Zamperla Giga Discovery. Pendulum ride. 172 feet (52 m) high. 75 miles per hour (121 km/h). Tallest pendulum ride in the world. 99 Steam Train 1971 1981 Crown Metal Products The 2 ft (610 mm) narrow gauge train ride to Trollywood, the troll country. Billy the Squid 1971 1973 Anton Schwarzkopf Polyp Ride. In 1973 this Polyp ride had a maintenance problem and was removed. The Jolly Monster was built on its site. Circus Wheel 1971 1999 Chance Rides Chance Trabant with Roman theming. It spun in a clockwise direction and tilted at the same time. The Trabant was removed and replaced with a Tilt-A-Whirl, retaining the Circus Wheel name. Circus Wheel 1981 2008 Sellner Manufacturing This Sellner Tilt-A-Whirl was known in the past under the names Fiesta Dance 1981-1981; Baile de las Flores 1982–1988 and Jolly Roger 1988–1999. The Tilt-A-Whirl was removed to make room for 3-Point Challenge basketball game, which was replaced by CraZanity. Tilt-A-Whirl has been in storage in a boneyard. Colossus 1978 2014 International Amusement Devices The iconic wooden coaster, which had two tracks, was redesigned in August 2014 as Twisted Colossus, a converted hybrid coaster. Condor 1988 1989 Huss Rides This Huss Condor was open for two years before being removed. It was removed to make room for Viper. Crazy Barrels 1971 1989 Intamin This Intamin Drunken Barrels was formerly located at a county fair. The Barrels were removed when the ride closed in 1989 and the platform for where the ride used to be was demolished in late 2017. Déjà Vu 2001 2011 Vekoma Located in "Cyclone Bay". A Floorless coaches suspended beneath an overhead track traverse the track forward and in reverse. Removed and the coaster was sent to Six Flags New England as Goliath. Dragon 1974 1981 Arrow Development This transportation cable railway transported riders from the upper level of the back of the mountain down to the lower level, and vice versa. The ride ceased operation in 1981 but was not removed until Ninja was built in 1988. Parts of the upper station were reused for Ninja, The Dragon's concrete track, wall, and lower station are visible to the left of Ninja's final lift hill. Eagle's Flight – El Dorado 1971 1981 Intamin This Intamin aerial sky-way ride took passengers from the upper part of the mountain to the lower land on the north of the mountain. The station was next to El Bumpo's area. Eagle's Flight – Galaxy 1971 1994 Intamin A second aerial sky-way ride from the top of the mountain to the lower land in the County Fair area. El-Bumpo 1971 1979 Arrow Development Gas-powered bumper boats located on the pond. Flashback 1992 2008 Intamin Steel roller coaster featuring a stacked design and numerous steep rolling track dives. The Flashback was standing but not operating starting in 2003 and demolished and scrapped in 2008. Freefall 1982 2008 Intamin An Intamin 1st-generation Freefall. The ride was standing but not operating from 2005 to 2006; however, it was scrapped for the 2008 season. Galaxy 1971 1979 Astron International Corporation A Robinson double Ferris wheel with cable pulley that looked like a V-shaped beam. The ride was removed and was located where Buccaneer and Swashbuckler are now sitting. Grand Centennial Excursion Railroad 1975 1985 A 3 ft (914 mm) narrow gauge steam train that took passengers around. Located north of the main mountain. Granny Gran Prix 1971 2007 D. H. Morgan This track-guided car ride was known as Chevron Gran Prix (Gas Powered) from 1971–1986. A new turnpike (electric-powered) was opened for three years before being moved in 1988 to Bugs Bunny World. The old guided track was demolished to make room for Tidal Wave. In December 2007 it was demolished to make room for Thomas Town's opening in 2008. Green Lantern: First Flight 2011 2017 Intamin The coaster opened in 2011 and became the first and only Intamin Ball Coaster/ZacSpin in North America. However, the ride immediately became famous for a shaky and very painful experience due to the manufacturer modifying the cars at the park's request to reduce spinning, resulting in unnatural movements. The coaster last operated in 2017, and stood silently with the intention of refurbishment before being officially "retired" in March 2019. Jolly Monster 1973 1981 Eyerly A standard Eyerly Monster ride which replaced Billy the Squid. This thrill ride was at the Pirate's Cove near Colossus, Buccaneer, and Swashbuckler. The ride was removed and its site sat empty for 7 years before the Tilt-A-Whirl was moved there. Log Jammer 1971 2011 Arrow Development Log flume featuring two large drops. Removed to make way for Full Throttle. Magic Pagoda 1974 1984 A walk-thru attraction located on Samurai Summit. It featured a talking Buddha, a mirror maze, a strobe light room (with a dragon flying overhead), a walk through a miniature version of Chinatown and various other small scale items of interest with a Chinese Theme. Now used as part of a walk-through maze for the Halloween season. Metro 1971 2011 Universal Mobility This monorail ride ran three stations; one at the High Sierra Territory (Demolished, now serves as Reds Revenge Haunted Maze during Frightfest), one at the Colossus County Fair (Demolished in 2017 to make room for the CraZanity Pendulum ride) and one at Samurai Summit (this station is currently used as the launch tunnel for Full Throttle). The monorail had been standing but not operating since 2001 and it was announced by Six Flags in 2007 that the ride would have no plans to reopen. The trains were located near the former location of Flashback where they sat for 10 years. In 2011 the monorail trains are relocated to Hersheypark. The abandoned track has been taken down in all areas readily visible to parkgoers but sections of track still exist and may be glimpsed in heavily overgrown sections of the park such as the area behind Buccaneer and Swashbuckler. Mountain Express 1973 1982 Anton Schwarzkopf Wildcat coaster located near where Flashback stood. Relocated to Magic Landing as Wildcat and then to Bosque Magico as Montana Rusa. Psyclone 1991 2006 Dinn Corporation A wood tracked roller coaster patterned after the Cyclone at Astroland park in Brooklyn, New York. It was torn down for the 2007 season, and piles of wood remained at the site for many days after the destruction. The site is now home to another wooden coaster, Apocalypse. Reactor 1977 1993 Anton Schwarzkopf A Schwarzkopf Enterprise, known from 1977–1987 as Enterprise, was renamed Reactor in 1987. This thrill ride was removed at the end of the 1993 season. Sarajevo Bobsleds 1984 1986 Intamin Bobsled coaster named after the 1984 Olympics. Removed due to the Six Flags ride rotation program and replaced with Shockwave. It was moved to Six Flags Over Texas and opened as Avalanche, but was later renamed and rethemed as La Vibora to better match the Spain section of the park. Scrambler 1973 2003 Eli Bridge This scrambler had a lot of damage from an uprooted tree and was scrapped; however, Six Flags Magic Mountain received another scrambler from Six Flags Over Texas. Shockwave 1986 1988 Intamin A Steel Standup looping roller coaster. it was removed in 1989 and relocated to Six Flags Great Adventure due to the ride rotation program. Sierra Twist 1973 2008 Anton Schwarzkopf A Schwarzkopf Bayern Kurve ride, originally known as Swiss Twist. It was a high-speed bobsled ride with a circular track. The ride was removed due to aging parts and high maintenance costs. Spin Out 1971 2008 Chance Rides A Chance Rotor known from 1971–1972 as Bottoms Up. Featured in the video for Belinda Carlisle's No. 1 hit song, "Heaven is a Place on Earth"
Thrill Shot 2001 2012 S&S Worldwide Rapidly ascending slingshot attraction. The ride requires a nominal fee from guests to participate. Thrill Shot closed in 2009 and never reopened due to high maintenance costs. 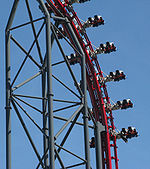 In early 2012, Thrill Shot was removed. Tumble Drum 1974 1980 This walk-through barrel roll was located near the Electric Rainbow (Round up ride). Yosemite Sam Sierra Falls 1993 2010 WhiteWater West Industries Double tube waterslides with dingy raft on location at the Bugs Bunny World. Demolished to make room for Road Runner Express. Z-Force 1987 1993 Intamin An Intamin Looping Starship/Space Shuttle themed as an Air Force fighter plane. The ride was removed at the end of the season in 1993 to make room for Batman: The Ride. The Riddler's Revenge, the world's tallest and fastest stand-up roller coaster featuring six inversions. Full Throttle is a launch roller coaster which features the world's highest vertical loop at 160 ft (49 m). Six Flags Magic Mountain's coasters are commonly ranked high in Amusement Today's annual Golden Ticket Awards. With the opening of Full Throttle on June 22, 2013, Six Flags Magic Mountain obtained the world record for the largest number of roller coasters in an amusement park. Below is a table with roller coasters at Six Flags Magic Mountain and their highest ranking in the Golden Ticket Awards. Six Flags Magic Mountain has several attractions that set world records in various categories. One of the world's first 2 roller coasters to reach 100mph. First roller coaster to reach 400 ft (122 m). becoming the world's tallest coaster until 2003. X² 4th Dimension roller coaster X: January 12, 2002 ; X²: May 24, 2008 World's first 4th dimension roller coaster. Features flipping seats, chainlift music, fog and fire. ^ a b "TEA/AECOM 2017 Global Attractions Attendance Report Report" (PDF). Themed Entertainment Association. May 21, 2018. Retrieved May 21, 2018. ^ "The Newhall Land and Farming Company". Encyclopedia of Company Histories. The Gale Group. Retrieved April 20, 2007. ^ MacDonald, Brady (May 2, 2012). "Six Flags Magic Mountain to reclaim roller coaster title". Los Angeles Times. Tribune Company. Retrieved May 2, 2012. ^ Robinson, Paul (January 9, 2012). "Remembering RTD and the "good old days" of cheap LA area public transit". Stories, Parables, and Long Items. Archived from the original on November 29, 2014. Retrieved February 4, 2013. ^ "Time Warner Completes Six Flags Purchase – Los Angeles Times". Los Angeles Times. ^ "Magic Mountain Reopens After Melees – Los Angeles Times". Los Angeles Times. ^ "Six Flags to Explore Strategic Options for Six Properties – Buffalo, Concord, Denver, Seattle, Houston and Los Angeles; Company Provides Mid-Quarter Update on Operations" (Press release). Business Wire. June 22, 2006. Retrieved June 27, 2006. ^ Hart, Lance (May 4, 2007). "Six Flags Magic Mountain". Screamscape.com. ^ Clark, Adam (August 3, 2006). "Six Flags Posts 2Q Loss of $39.6 Mil". The Santa Clarita Valley Signal. Archived from the original on February 24, 2007. ^ "Teen creating some magic with his Six Flags museum – LA Daily News". Daily News. Archived from the original on March 4, 2008. ^ "Six Flags Announces Terminator Coaster For Magic Mountain". Ultimate Rollercoaster. October 22, 2008. ^ "Magic Mountain 'highly profitable' despite bankruptcy cloud looming over Six Flags". LA Times. March 16, 2009. ^ MacDonald, Brady (May 27, 2010). "Six Flags Magic Mountain delays launch of 17th coaster until 2011". LA Times. Retrieved October 16, 2010. ^ a b MacDonald, Brady (August 3, 2010). "Superman coaster at Six Flags Magic Mountain to get major makeover in 2011". LA Times. Retrieved October 16, 2010. ^ "Mr. Six's Splash Island to Debut Memorial Day Weekend". Six Flags. March 24, 2010. Archived from the original on December 31, 2010. Retrieved October 16, 2010. ^ Hart, Lance (October 14, 2010). "Six Flags Magic Mountain". Screamscape. Retrieved October 21, 2010. ^ Scollins, Mike (October 20, 2010). "Magic Mountain: More Coasters Than Any Other Theme Park ON THE PLANET!". Six Flags Blog. Archived from the original on July 16, 2011. Retrieved October 21, 2010. ^ "Magic Mountain reveals new Green Lantern ride". ABC. October 20, 2010. Retrieved October 21, 2010. ^ MacDonald, Brady (October 19, 2010). "Six Flags Magic Mountain to run Superman coaster backward". Los Angeles Times. Retrieved October 21, 2010. ^ MacDonald, Brady (October 19, 2010). "Six Flags Magic Mountain aims to reclaim coaster crown with Green Lantern in 2011". Los Angeles Times. Retrieved October 21, 2010. ^ "Six Flags Entertainment Corporation Investor Meeting". WebCast. Six Flags. November 4, 2010. Archived from the original on November 5, 2015. ^ Six Flags Magic Mountain. "Family Rides". Six Flags Magic Mountain. ^ MacDonald, Brady (December 3, 2010). "Six Flags Magic Mountain renaming Terminator wooden coaster". LA Times. Retrieved December 3, 2010. ^ MacDonald, Brady (November 25, 2010). "Six Flags amusement parks prepare for thematic makeovers". LA Times. Retrieved November 27, 2010. ^ MacDonald, Brady (January 18, 2011). "Five 'new' coasters coming to Six Flags Magic Mountain? Not so fast". LA Times. ^ Constantine, Sandra (August 16, 2011). "Six Flags New England working to add new roller coaster ride to its Agawam amusement park". News Article. MassLive.com. ^ Hagist, Jenna (August 18, 2011). "Six Flags Adds New Coaster". News Article. Wggb.com. Archived from the original on October 2, 2011. ^ MacDonald, Brady (August 19, 2011). "Six Flags Magic Mountain to remove Deja Vu coaster". Los Angeles Times. Retrieved August 19, 2011. ^ Six Flags Magic Mountain (September 2, 2011). "Hey Déjà Vu fans!..." Facebook. Retrieved September 4, 2011. ^ Six Flags Magic Mountain (September 13, 2011). "Déjà Vu fans..." Facebook. Retrieved September 13, 2011. ^ Screamscape (June 24, 2013). "Screamscape.com". Screamscape. Archived from the original on 2013-07-04. Retrieved July 26, 2013. ^ "New for 2014". August 29, 2013. Archived from the original on September 1, 2013. Retrieved August 29, 2013. ^ Six Flags Magic Mountain (April 8, 2014). "Six Flags Magic Mountain Lights Up the Season by Introducing Holiday in the Park® Event". Six Flags. Retrieved April 8, 2014. ^ MacDonald, Brady (August 28, 2014). "Six Flags Magic Mountain turning wooden coaster into Twisted Colossus". Los Angeles Times. Retrieved February 20, 2019. ^ a b MM, Six Flags (2017-06-28). "Just Announced! JUSTICE LEAGUE: Battle for Metropolis opens to the public on July 12! Who's ready to Join the League!? #JusticeLeaguepic.twitter.com/aEbm9uAPsA". @SFMagicMountain. Retrieved 2017-09-16. ^ "New for 2018 | National". National. Retrieved 2017-09-16. ^ "World's Tallest Pendulum Ride, CraZanity, at Six Flags Magic Mountain in 2018 - Now 365 Days of Thrills". Business Wire. August 31, 2017. ^ Barrera, Sandra (February 20, 2018). "This is what Six Flags Magic Mountain's newest thrill ride building site looks like right now". Los Angeles Daily News. Los Angeles, California. Retrieved April 10, 2018. ^ Six Flags Magic Mountain (April 10, 2012). "Six Flags Magic Mountain has a cameo appearance ..." Facebook. Retrieved April 10, 2012. ^ Dahlin, Kurt (1 October 2013). "Toyota Camry Thrill Ride At Six Flags Magic Mountain". thecoasterguy.com. Retrieved 19 February 2014. ^ RCTgo (23 August 2014). "Six Flags Magic Mountain (2014) - Downloads - RCTgo". rctgo.com. Retrieved 13 May 2018. ^ "Six Flags Magic Mountain Announces New Ride Speedy Gonzales Hot Rod Racers". KHTS AM 1220. Archived from the original on February 21, 2014. ^ Kurt Dahlin. "Ride Profile: Orient Express". Retrieved February 8, 2014. ^ a b "Six Flags Magic Mountain to scrap 'one of the worst coasters ever'". Santa Cruz Sentinel. March 26, 2019. ^ "Amusement Today — Golden Ticket Winners 2012" (PDF). Amusement Today. Archived from the original (PDF) on September 19, 2012. Retrieved September 10, 2012. ^ Sandy, Adam. "Coney Island History". Roller Coaster History. Ultimate Roller Coaster. Retrieved 3 July 2013. ^ William-Ross, Lindsay (May 8, 2010). "You Say You Want a Revolution? 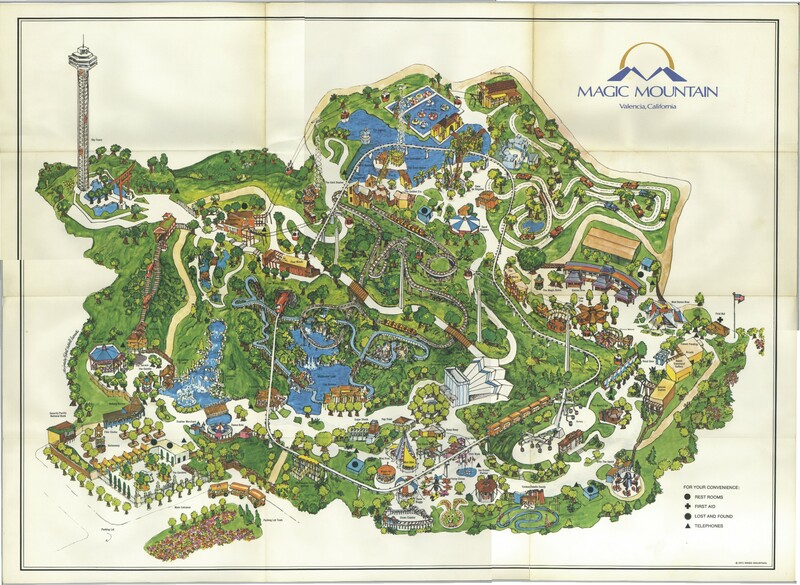 Magic Mountain's Turns 34 Today". LAist. Archived from the original on June 18, 2015. Retrieved July 3, 2013. Wikimedia Commons has media related to Six Flags Magic Mountain. Wikivoyage has a travel guide for Magic Mountain.